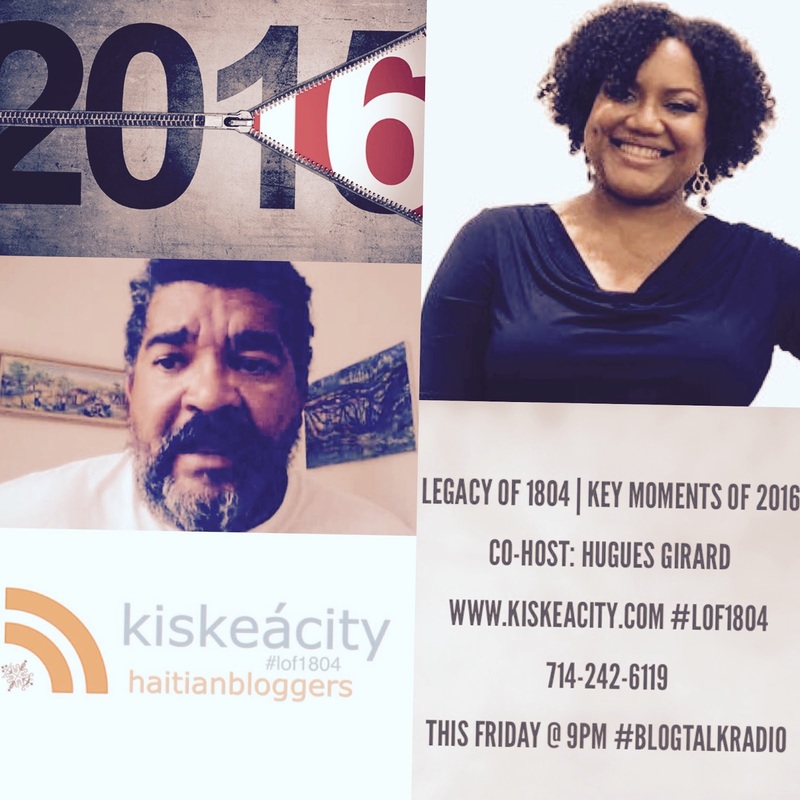 This Friday at 9PM, join me and guest co-host Hugues Girard to review key Haitian and global political moments in 2016. The show will stream live here or you can listen at http://www.blogtalkradio.com/pancaribbean/2016/12/31/legacy-of-1804-key-moments-in-2016-lof1804 or on the phone at 714-242-6119. Haiti. See notes here. This time he will answer questions left unanswered from the last show and we will also discuss other articles such as The Helplessness of Haiti -- no we don't love this title -- and Donald Trump Discovers Haiti. senior editor and Tokyo bureau chief at Fortune, New York bureau chief of USA Today, executive editor of Black Enterprise and a feature writer and music critic for The Washington Post. He was managing editor of The Root from 2009 to 2011. He co-authored The Bakke Case: The Politics of Inequality. A native of Haiti and long-time New Yorker, Joel now lives in Paris, where he is completing a book about his family’s 300-year involvement with Haiti. 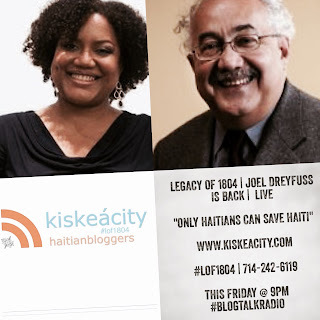 The show will stream live here or you can listen at http://www.blogtalkradio.com/pancaribbean/2016/12/24/legacy-of-1804-joel-dreyfuss-is-back-live-lof1804 or on the phone at 714-242-6119. 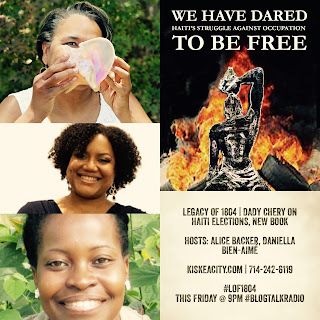 This Friday at 9PM, join me and co-host Daniella Bien-Aimé of the Bien-Aimé Post as we welcome journalist and professor Dady Chéry to discuss the latest Haiti election and its aftermath as well as her book We Have Dared to Be Free. author of We Have Dared to Be Free: Haiti’s Struggle Against Occupation. wealth for a popular audience. You can listen online at kiskeacity.com, at http://www.blogtalkradio.com/pancaribbean/2016/12/17/legacy-of-1804-dady-chery-on-haiti-elections-new-book-lof1804 or on the phone at 714-242-6119. 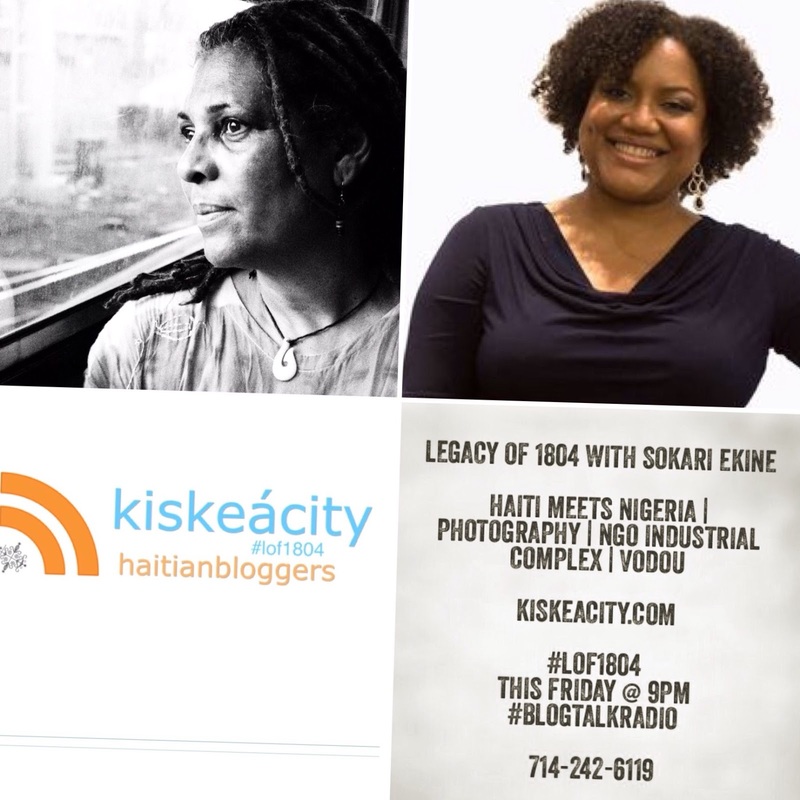 This Friday at 9PM, join me as I welcome photographer Sokari Ekine of blacklooks.org to discuss her photo exhibit Spirit Desire inspired by her journey through Haiti and its spirituality as a journalist, educator, IDP Camp volunteer and mobile clinic attendant. The exhibit opens at Calabar Gallery in Harlem on January 25, 2017. Sokari is a Nigerian activist, writer and photographer whose work and writing is engaged with pan-Africanist, anti-imperialist, femnist and environmental politics — in both Haiti and Nigeria. She has written for academic journals, anthologies and news publications including Pambazuka News, Feminist Africa and New Internationalist and she is the editor of Blood and Oil: Testimonies of Violence from Women of the Niger Delta, SMS Uprising: Mobile Phone Activism in Africa, and with Firoze Manji, African Awakening: The Emerging Revolutions. 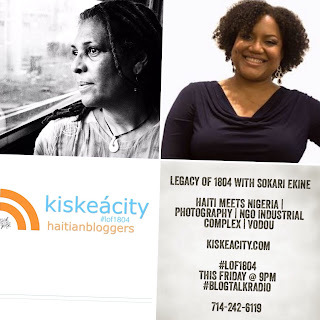 You can listen online at kiskeacity.com, at http://www.blogtalkradio.com/pancaribbean/2016/12/10/legacy-of-1804-with-sokari-ekine-lof1804-haiti-nigeria or on the phone at 714-242-6119. Join me this Friday at 9PM as I welcome Dr. Paul Camy Mocombe, an Assistant Professor at West Virginia State University, to discuss Fidel Castro and Haiti. Dr. Mocombe is a social theorist interested in race, class and globalization. He is the author of Jesus and the Streets, Race and Class Distinctions Within Black Communities; Language, Literacy, and Pedagogy in Postindustrial Societies; A labor Approach to the Development of the Self or Modern Personality: The Case of Public Education, Education in Globalization; Mocombe’s Reading Room Series; and The Mocombeian Strategy: The Reason for, and Answer to Black Failure in Capitalist Education. 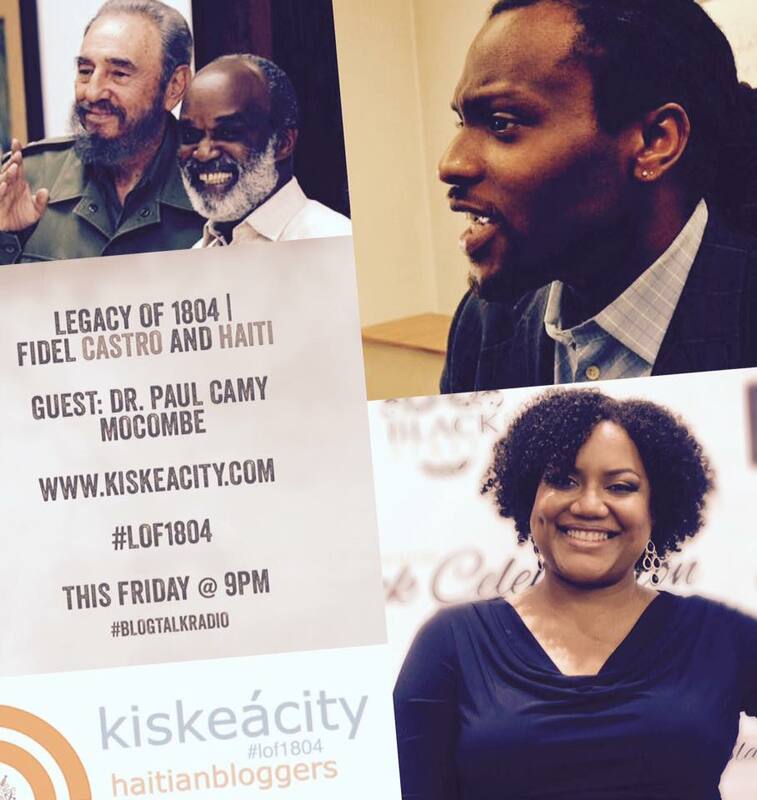 You can listen online at kiskeacity.com, at http://www.blogtalkradio.com/pancaribbean/2016/12/03/legacy-of-1804-fidel-castro-and-haiti-lof1804 or on the phone at 714-242-6119.